From June 28th through 30th, about fifty former and current students, colleagues and friends of Brandeis astrophysics Professors John Wardle and David Roberts gathered in the Physics building for a symposium titled “When Brandeis met Jansky: astrophysics and beyond.” This event was organized to celebrate their achievements in astrophysics and their impact on generations of students. Their work has established Brandeis as a major player in radio astronomy. The symposium title refers to Karl Jansky who is credited with starting an entirely new means of studying the cosmos using radio waves. Radio astronomy arrived at Brandeis with Professor Wardle in 1972. He was joined in 1980 by Professor Roberts and together they pioneered a very powerful observational technique called Very Long Baseline Polarimetry. This involves the use of telescopes separated by thousands of kilometers to produce the sharpest images available to astronomers. 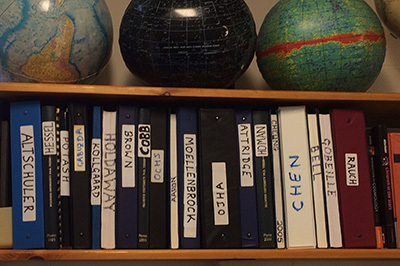 Their methods allow astronomers to map the magnetic fields in and near celestial objects. With their students and colleagues, John and Dave have exploited this technique to study the magnetic fields in quasars and active galaxies, and near super massive black holes far outside our Milky Way galaxy as well as black holes closer to home. The reach of John and Dave’s work was reflected in the content of the presentations and the composition of the attendees, some of whom had traveled from as far afield as South Korea, India, and Europe. All major centers of radio astronomy were represented. At the conference dinner, several former students expressed their appreciation for the roles Dave and John have played as their mentors. In their presentations, Dave and John described their current projects and highlighted the work of their undergraduates, graduate students and postdoctoral fellows, who have all gone on to successful careers in academia and industry. Professor Roberts has decided to retire at the end of August, though his retirement plans include a huge program of continuing research into unusual-shaped radio galaxies. These may represent galaxy mergers and the possible merger of their central black holes, and is being carried out with colleagues in India. 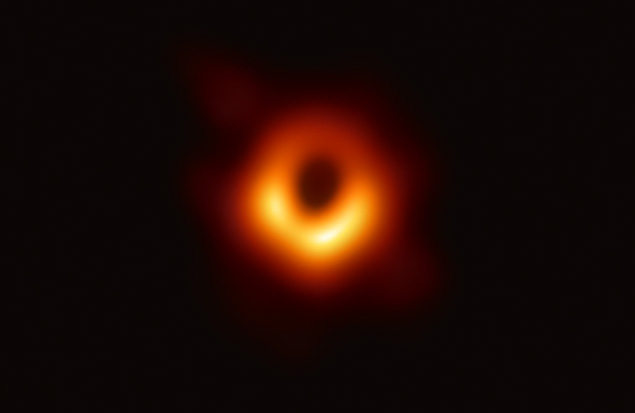 Professor Wardle has no intention of retiring and is expanding his horizons so to speak — he is part of the Event Horizon Telescope collaboration, an international team of astronomers that is attempting to make the first image of the ‘event horizon’* of a black hole! 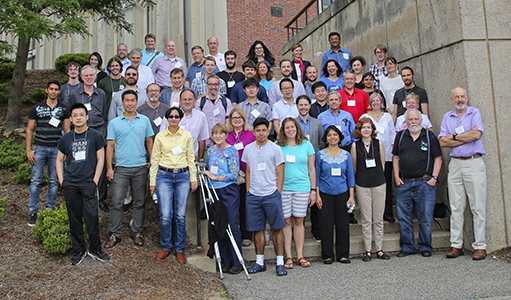 The symposium was organized by Teddy Cheung (PhD ’05, now at the Naval Research Laboratory) and Roopesh Ojha (PhD ’98, now at NASA, Goddard Space Flight Center), with generous help and support from the Physics Department. * The boundary around a black hole beyond which nothing can escape. On November 28, NASA posted a press release announcing the record breaking discovery of an x-ray emitting jet in a quasar at a distance of 12.4 billion light years from Earth. The discovery is published in the Astrophysical Journal Letters, and the lead author is C. (Teddy) Cheung (Brandeis PhD 2004). Co-authors include Doug Gobeille (Brandeis PhD 2011), Brandeis professor of astrophysics John Wardle, and colleagues from the Harvard-Smithsonian Center for Astrophysics. Teddy Cheung made the x-ray image, using the orbiting Chandra X-ray observatory, and Doug Gobeille made the radio image as part of his PhD research at Brandeis using the 27 antennas of the Very Large Array in New Mexico. A jet of X-ray emitting plasma from a supermassive black hole 12.4 billion light years from Earth has been detected by NASA’s Chandra X-ray Observatory. This is the most distant X-ray jet ever observed and gives astronomers a glimpse into the explosive activity associated with the growth of supermassive black holes in the early universe. The jet was produced by a quasar named GB 1428+4217, or GB 1428 for short. Giant black holes at the centers of galaxies can pull in matter at a rapid rate producing the quasar phenomenon. The energy released as particles fall toward the black hole generates intense radiation and powerful beams of high-energy particles that blast away from the black hole at nearly the speed of light. These particle beams can interact with magnetic fields or ambient photons to produce jets of radiation. “We’re excited about this result not just because it’s a record holder, but because very few X-ray jets are known in the early universe,” said Teddy Cheung of the National Academy of Sciences, resident at the Naval Research Laboratory in Washington DC, and lead author of the paper describing these results. As the electrons in the jet fly away from the quasar, they move through a sea of background photons left behind after the Big Bang. When a fast-moving electron collides with one of these so-called cosmic microwave background photons, it can boost the photon’s energy into the X-ray band. 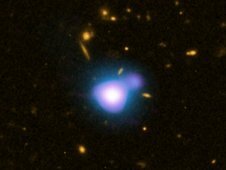 “Since the brightness of the jet in X-rays depends, among other things, on how fast the electrons are moving away from the black hole, discoveries like the jet in GB 1428 tell us something about the environment around supermassive black holes and their host galaxies not that long after the Big Bang,” said co-author Lukasz Stawarz from the Japan Aerospace Exploration Agency, in Kanagawa, Japan. Because the quasar is seen when the universe is at an age of about 1.3 billion years, less than 10% of its current value, the cosmic background radiation is a thousand times more intense than it is now. This makes the jet much brighter, and compensates in part for the dimming due to distance. While there is another possible source of X-rays for the jet — radiation from electrons spiraling around magnetic field lines in the jet — the authors favor the idea that the cosmic background radiation is being boosted because the jet is so bright. Prior to the discovery of the jet in GB 1428, the most distant X-ray jet known was 12.2 billion light years away, and another is located at about 12 billion light years, both discovered by authors of the GB 1428 paper. A very similar shaped jet in GB 1428 was also detected in radio waves with the NSF’s Very Large Array (VLA). The particle beams that produce these three extremely distant X-ray jets appear to be moving slightly more slowly than jets from galaxies that are not as far away. This may be because the jets were less energetic when launched from the black hole or because they are slowed down more by their environment. The researchers think the length of the jet in GB 1428 is at least 230,000 light years, or about twice the diameter of the entire Milky Way galaxy. This jet is only seen on one side of the quasar in the Chandra and VLA data. When combined with previously obtained evidence, this suggests the jet is pointed almost directly toward us. This configuration would boost the X-ray and radio signals for the observed jet and diminish those for a jet presumably pointed in the opposite direction. Observations were also taken of GB 1428 with a set of radio telescopes at different locations around the Earth that allows details to be resolved on exceptionally small scales. They revealed the presence of a much smaller jet, about 1,900 light years long, which points in a similar direction to the X-ray jet. This result appeared in the September 1st, 2012 issue of The Astrophysical Journal Letters. Other co-authors of the paper are Doug Gobeille from University of South Florida in Tampa, FL; John Wardle from Brandeis University in Waltham, MA; and Dan Harris and Dan Schwartz from the Harvard-Smithsonian Center for Astrophysics.